March always makes me think of lamb. "In like a lion, out like a lamb" as the saying goes, which seems to be holding true considering the nasty windstorm that hit us over the weekend! 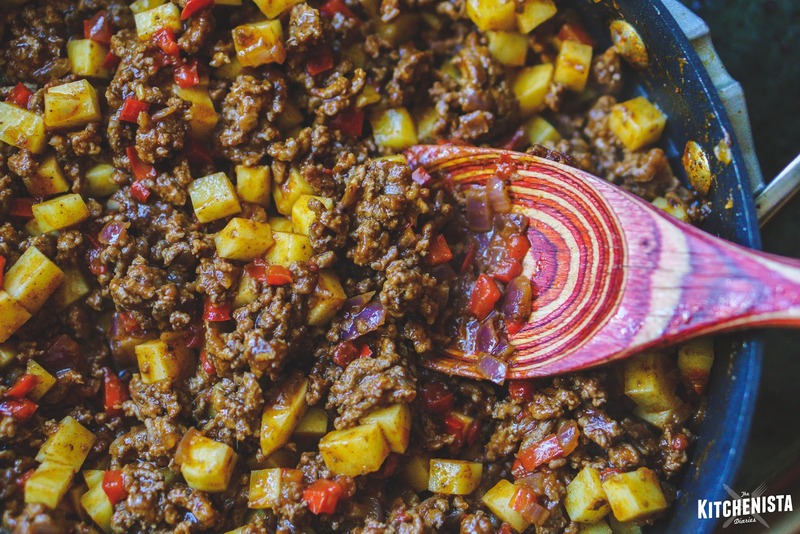 We're a few weeks away from all the spring holiday inspired menus featuring fancy lamb roasts, but there's never a bad time to utilize ground lamb in your recipes. 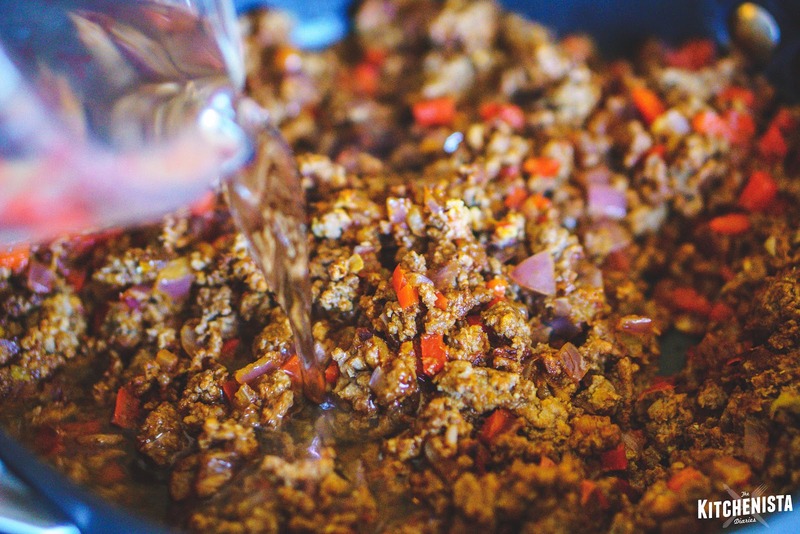 It's an easy swap for ground beef, takes really well to bold seasonings, and is usually only a dollar or two more per pound. I was in the mood for a project today, so I tackled this recipe for meat pies that I've wanted to finalize for quite some time. 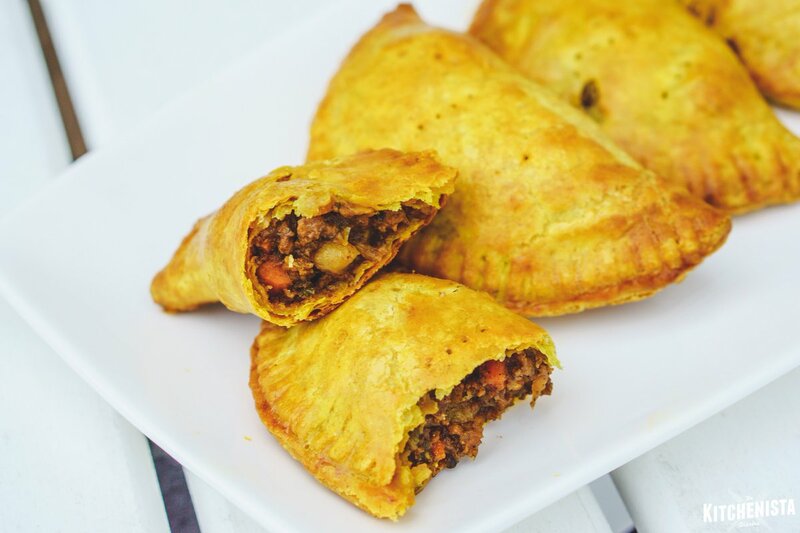 I originally made them about a year ago, at the time inspired by Jamaican beef patties and a Moroccan spiced Shepherd's Pie made with ground lamb. 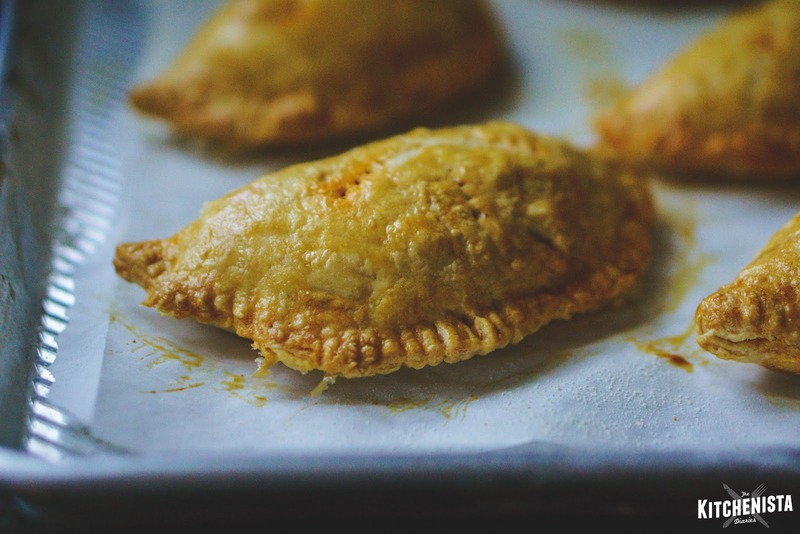 In my last post, I shared how I experienced some issues with the crust, but a client's request for Nigerian meat pies led me down a more successful path. The final version of my recipe I'm sharing today incorporates all of these ideas. The crust is flaky and buttery like the best pie crust, but holds its shape better after baking. 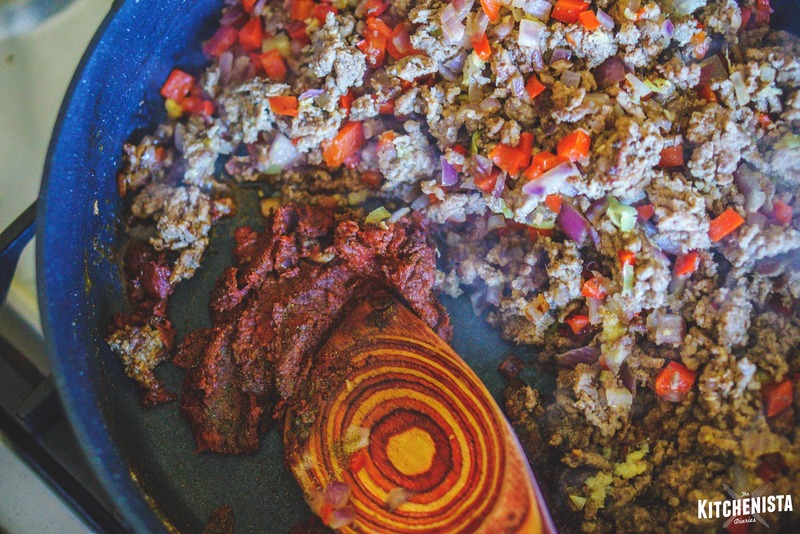 I kept the lamb filling - though this works just as well with ground beef - but the seasonings are more of a nod to West African and West Indian cuisine. 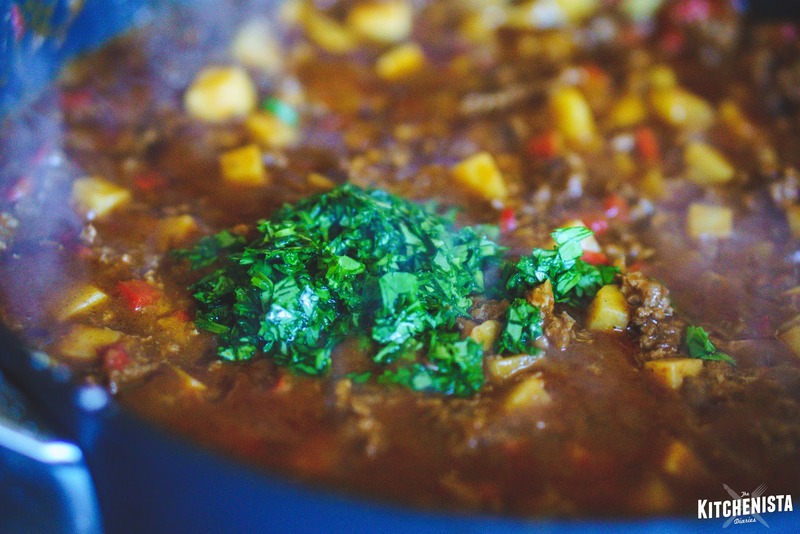 The meat is slightly spicy and fragrant, with hints of scotch bonnet, tomato, garlic, ginger, white peppercorns, cumin and cloves. I also added more of a gravy to keep the filling moist inside of the crust, something I picked up from a Nigerian meat pie video tutorial by Ivonne Ijayi, which was so helpful during this process! It's a two step process, so make the crust first, because that needs to rest in the fridge for at least an hour before rolling it out. The filling can be made in that time, and will also need to chill completely before using. Both components can be made a day or two in advance so it doesn't have to be done all in the same day! Special Equipment: Heavy duty sheet pans , dough scraper, pastry brush , rolling pin , parchment paper . As I mentioned above, you can use ground lamb or beef for this recipe, but I do hope you try the lamb! 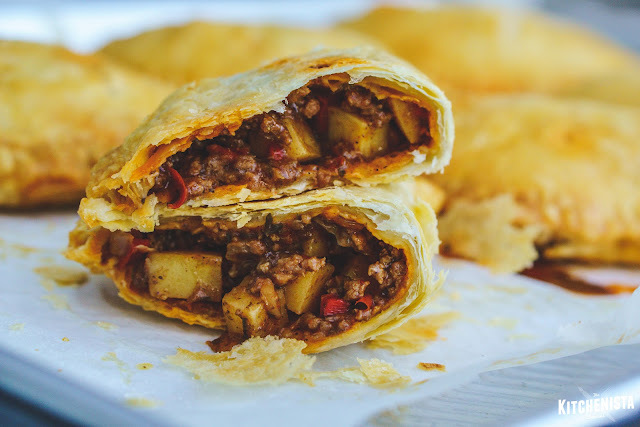 If you go with beef, stay in the range of 80/20 or 85/15, as meat that is too lean will result in a sad, dry meat pie filling. Start out by browning the meat in a large nonstick skillet over medium high heat. As you cook the meat, break up any large chunks. Cook until no pink remains, then drain excess fat to leave only a couple tablespoons behind. If at any point you need more fat in the pan during this cooking process, use a little bit of the drained grease or supplement with cooking oil. Add the diced onions and peppers to the skillet. 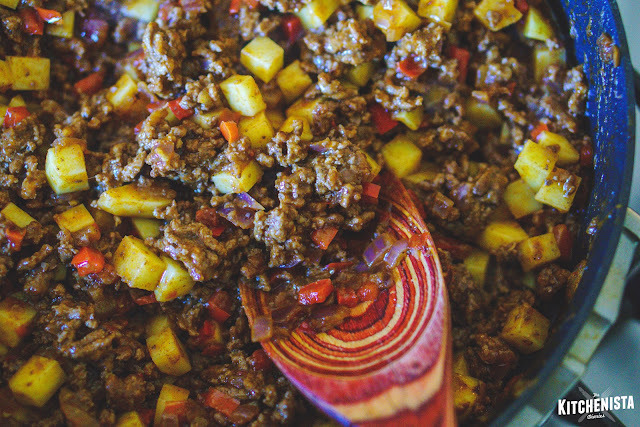 Season with a pinch of salt, then stir the veggies into the meat so they start to make contact with the pan. Cook just until the veggies start to soften, one or two minutes. Stir in the grated garlic, ginger, and scotch bonnet pepper. Scotch bonnets are extremely spicy, so use gloves when handling, or if you're like me and refuse to adhere to that advice, at least remember to wash your hands really thoroughly afterwards. If you can't find scotch bonnets at your store, habaneros will work although the flavor will be different. This is a really versatile recipe though, so use what you have - even crushed red pepper flakes would work well. Push some of the meat over to the side to make room in the skillet. Add a little oil or fat, then drop in the tablespoon of tomato paste and all spices. Stir the paste into the skillet to cook out the raw tomato flavor and bloom the spices, which takes about a minute. Next, stir in the potatoes. You want just enough liquid in the pan to barely reach the level of the meat and potatoes, so add a little more if necessary. The potatoes should be diced on the smaller side so that they cook quickly and evenly. Gold potatoes will hold up in the cooking process better than Russets, which would turn to mash by the time the meat pies are baked. Turn down the heat to medium low and allow the meat to simmer just until the potatoes are knife tender but still have a little bite left, which should take about 5 minutes. 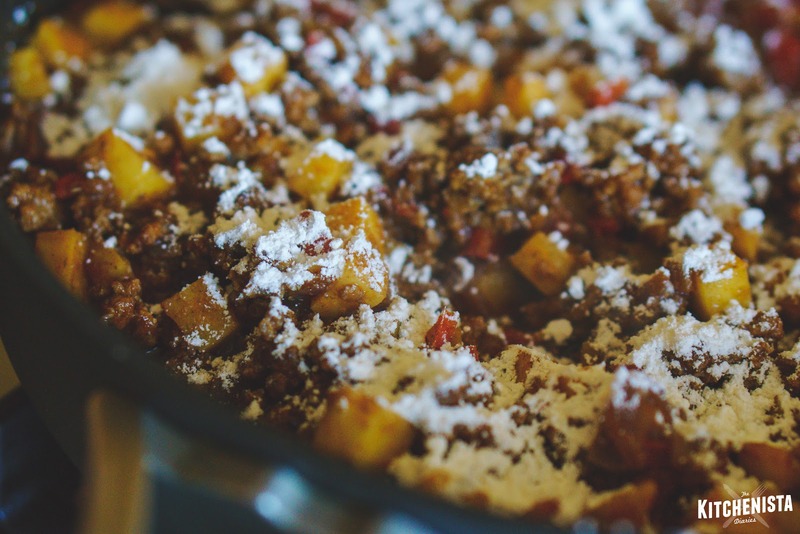 Sprinkle the contents of the skillet with a thin coating of flour, then mix it in being careful not to leave any lumps. Cook for another minute, while continuing to stir. This is essentially combining with the fat left in the skillet to make a roux, which will thicken the sauce. Pour in another cup of water, the Worcestershire sauce, and vinegar. Also add the minced cilantro. 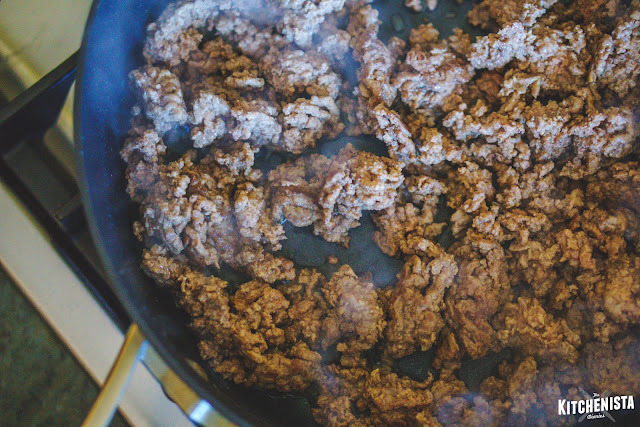 Turn the heat back up slightly and stir the contents of the skillet. Bring it up to a gentle boil, then reduce the heat back down to low and allow it to simmer until most of the water has evaporated and the resulting sauce has thickened like a gravy. Do a final taste test for salt. You should be able to drag your spoon across the pan without the filling immediately spilling back into the empty space. Let the mixture cool down, then transfer to the fridge for at least thirty minutes to chill completely. Meanwhile, if you haven't already done so from the previous post, prep your pastry dough. It should be chilled for at least an hour after the final step, and divided into twelve even sections. Keep all but a couple sections of the dough in the fridge as you work, so that it stays cold. Prep two sheet pans by lining each with parchment paper. 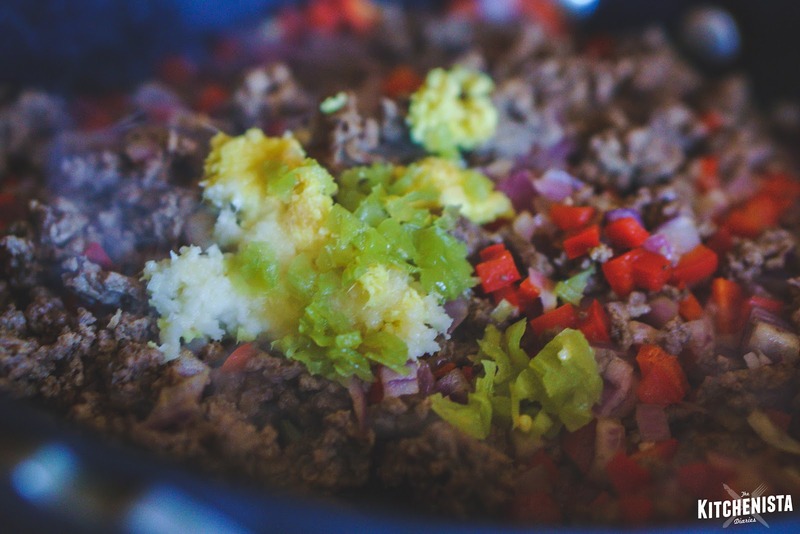 Once the meat filling is cold, you can begin assembly. 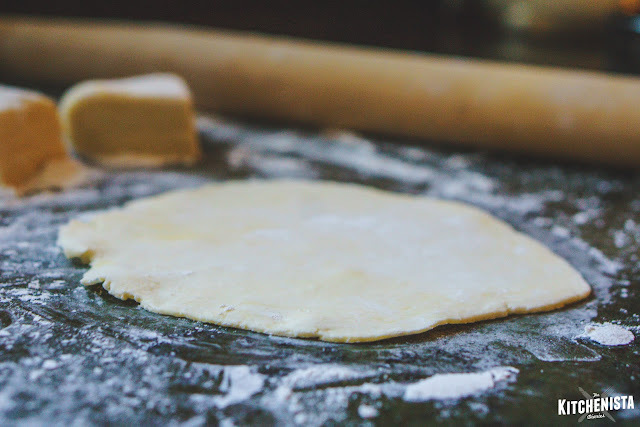 On a lightly floured surface, press one of the dough portions down with your hands to start creating a flat, round disk. Use your rolling pin to roll it out to about six inches in diameter. I didn't have a bowl that was the right size, so I used this pastry ring to guide me, trimming about 3/4 of an inch or so around its circumference. It doesn't really matter what you use so long as you figure out a way to keep all your circles about the same size. Once your circle of dough is cut out, place two tablespoons of filling in the center. Then carefully bring one side of the dough up over the filling and press it onto the opposite side. 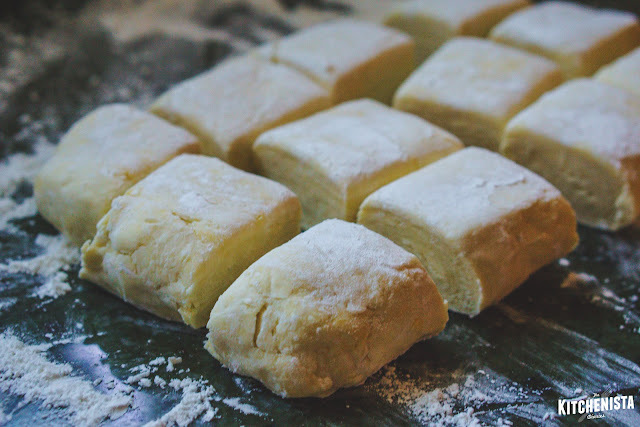 Use your fingers to press the ends of the dough together, sealing the edges all the way across. Try not to tear the dough. If you find that the pies are too hard to close, cut back a little bit on the amount of filling you're using. Use a floured fork to crimp the edges of the pie, which helps to make sure they are completely sealed. 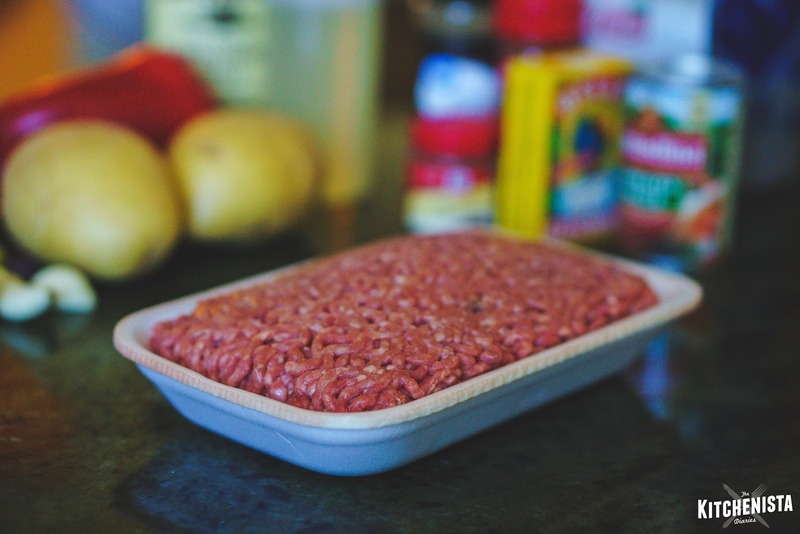 As you fill each meat pie, transfer it to a parchment lined sheet pan. Keep the sheet pan in the fridge or freezer. 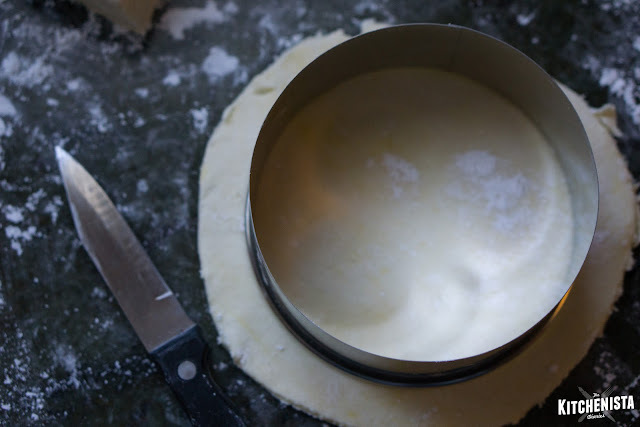 As you start to fill the pan up, you can move the colder pies over to the side and stack them up a bit; they won't stick as long as they've already firmed up. That way you won't have to make room for two pans in your fridge or freezer. It's going to be a lot of back and forth to the fridge between grabbing dough and transferring filled pies, but this makes sure that all your uncooked pastry stays as cold as possible. As I mentioned in my last post, dividing up the dough first yields very little scraps compared to rolling out the whole batch and then cutting circles. This was all I had left at the very end, not even enough to roll out a full circle! Preheat your oven to 425° F. Once you have filled all the pies, divide them between two pans so that they are in one layer with at least an inch of space between them. Beat an egg yolk with a teaspoon of water until frothy, then brush the tops of the pies with the egg wash. This helps create a golden finish when baked. Use a fork to poke a few holes in all of the pies, which will help release steam as they cook. Place the pies in the oven, as close to the middle rack as possible. 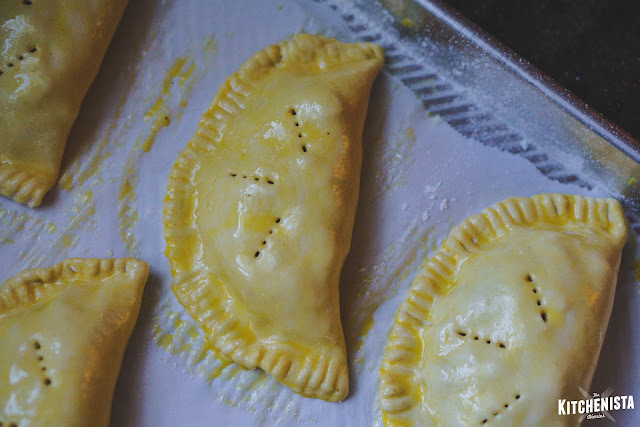 As soon as you put them inside, turn the oven heat down to 350° F. The initial high heat blast will help puff up the pastry, but to cook more evenly they do better at a lower temperature. Bake for 20 minutes, or until crusty and golden brown. Be careful not to overcook them, as the filling will start to spill out. This can also happen if you missed a spot when sealing the pies, as you can see in one of mine below! Luckily even the imperfect pies will still taste just as delicious. 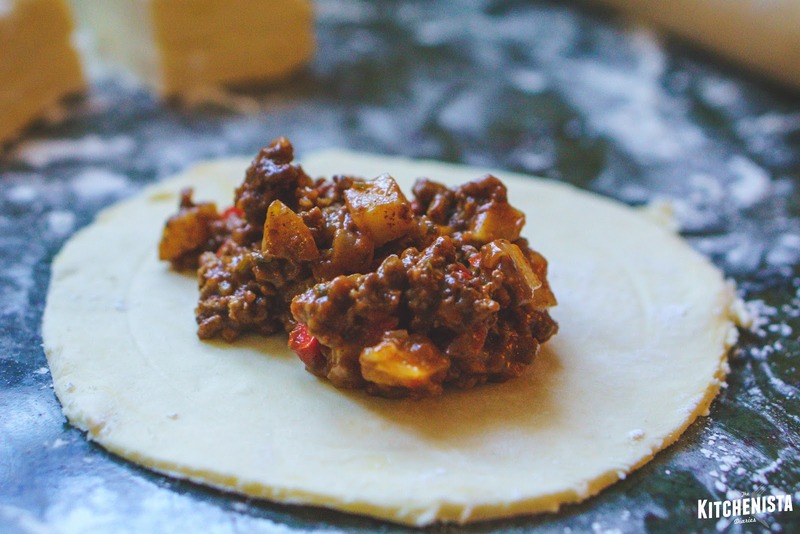 Let the meat pies cool for a few minutes before serving, as the filling will be extremely hot! These are great warm, at room temperature, or even cold. 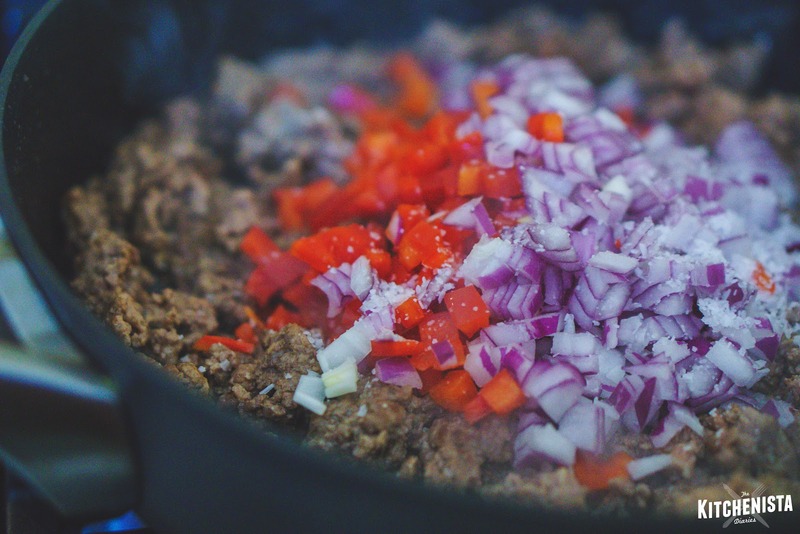 To reheat leftovers, simply place on a pan and warm them in the oven for a few minutes at 350° F. You can use the microwave instead, but they may not stay as crisp that way. Look at those layers! I was thrilled with the crust and the seasoned lamb was perfect. (I tested beef at the same time, so I promise it's just as good!) This is definitely a project and a half, but it's a great one to knock out over a weekend and stock up your freezer. You'll be happy when you can pull one or two out for a snack or light meal! My very first take on meat pies was as an eighteen year old, back home recovering from a disastrous freshman year of college. 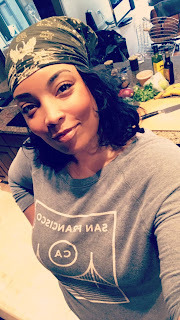 I retreated to the kitchen for months, attempting to make any and everything that caught my attention on Food Network. (This was in the early 00's, when they still featured real cooking shows!) It would be the first time in my life that the kitchen became a place for healing and reflection. I used to throw myself into recipes more complicated than my skill set dictated, but that was half the fun. 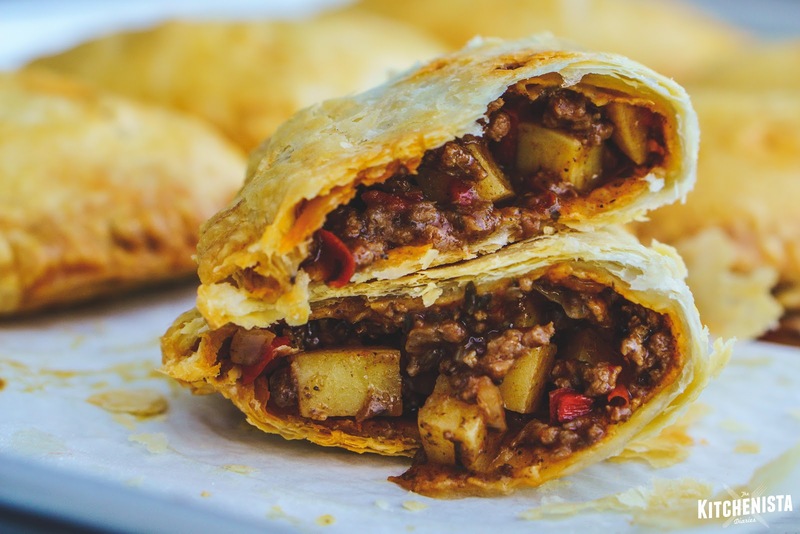 One of the things I ended up getting pretty good at making were these spicy ground beef and black bean hand pies. My mother even had me make a batch to take to a concert and swore her coworkers would pay me to put picnic baskets together. Sadly, I never ended up pursuing the idea but it's crazy to think about what could have become of a catering career had I given it a try back then. Most of these memories are fuzzy, but as they come back to me it's so interesting to realize how some signs of my true calling were always there. Sixteen years later, I would finally end up working as a personal chef, as you probably know by now! My first client in DC often wanted me to prepare Nigerian food. 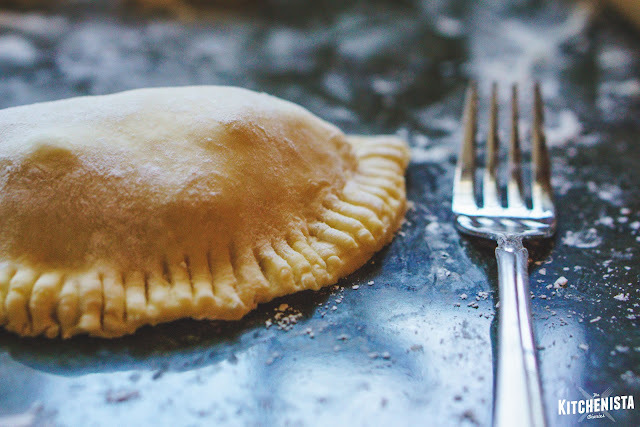 When he asked me to make meat pies to take on a trip, I was happy to oblige even though I had never attempted that specific version before. 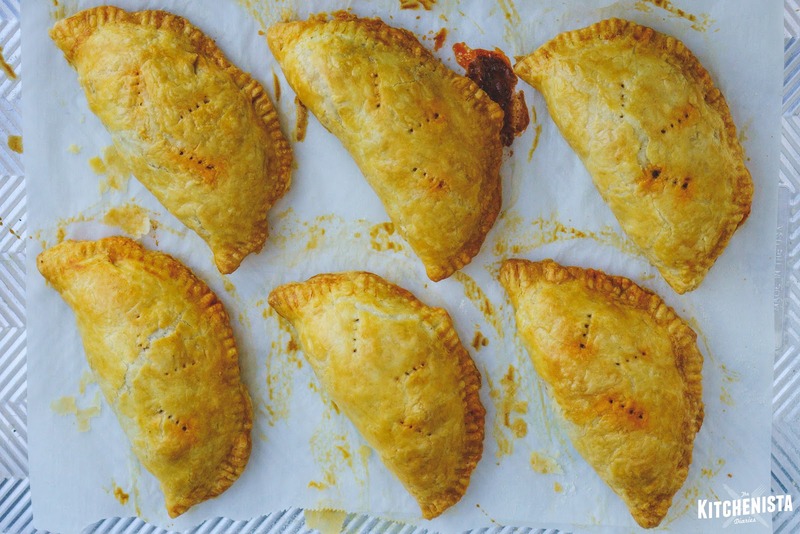 My only point of reference had been the meat & bean pies of my teenage years, and a more recent stab at a version inspired by Jamaican beef patties. 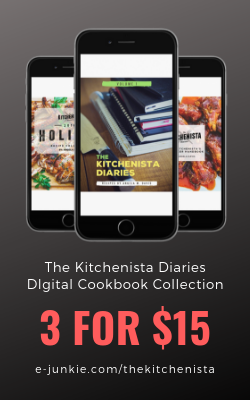 It can be challenging to cook something you've never tasted, but after a little research I felt like I knew enough to create my best interpretation. A video tutorial by Ivonne Ijayi helped me to visualize the technique and identify which parts were a little different than my usual process. 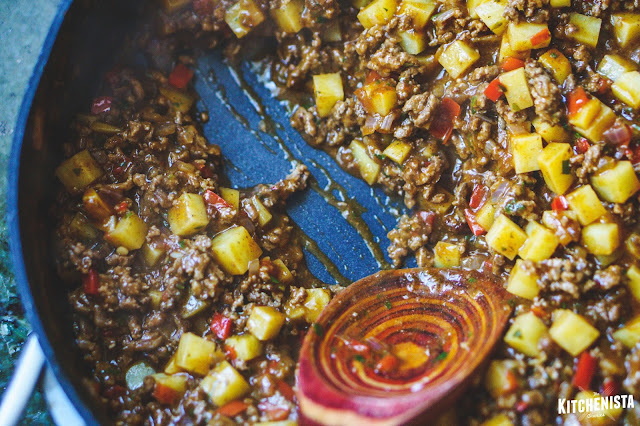 The filling was very similar to that of a Shepherd's Pie or picadillo, with browned ground beef bulked up with diced carrots and potatoes. At the time I had lots of homemade pie crusts already prepared in the freezer, so I went ahead and used that for the meat pies. The crust held up that day for my client's pies, but just barely. I knew that I would have to play around with a different dough to really lock down this recipe. My buttermilk dough is a dream to work with for pies, and makes for a super tender, flaky crust. However I found it to be a little too tender for meat pies, which you should be able to grab and hold onto without falling apart. That was first remedied by going back to my original pie crust made with ice water, minus the vinegar. Lately I've been skipping shortening in lieu of all butter, so I stuck with it (butter also yields a crisper crust, which works in my favor here.) Instead of mixing two cups of all-purpose flour with a cup of cake flour, I used a cup of bread flour, which has a higher gluten content and would help give the crust more structure. It was a tip I picked up from Lois at Yummy Medley, adapted to the proportions of my own pie crust recipe. Like Lois, I wanted to keep the flakiness of my crust, but create a bit more stability for a hand pie. One of the other things I needed to modify was my technique for rolling out the dough and cutting it into circles to make the pies. Typically by the time I get them all cut out, they were warming up too quickly to handle and the small size made them difficult to fill and seal. It also seemed like a hell of a lot of dough got wasted in the process of cutting circles out, and butter is too expensive for all that! (The alternative, gathering up scraps and rolling them out a second or third time, makes for a tougher crust.) 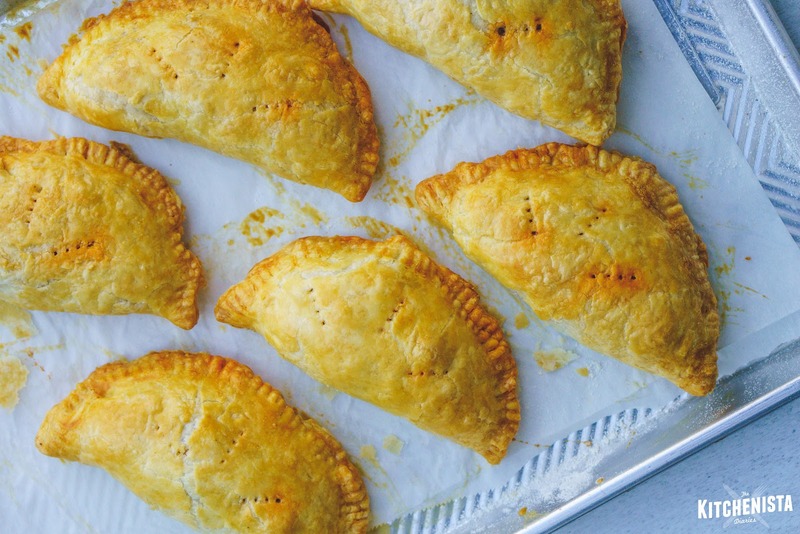 This wasn't a new problem - it's a big reason I have not really enjoyed making hand pies in the past. Going back to Ivonne Ijayi's video tutorial, I noticed that she divided the dough into equal parts first before rolling them out into individual circles. It reminded me of the way you'd roll out a batch of tortillas. I adapted her process, which solved both of my problems. It was easier to keep more of the dough in the fridge until I was ready to work with it, where it stayed cold. Dividing the dough up first made for less scraps, so there was no need to gather up the dough again and re-roll it out. The final adjustment was swapping out the whole egg in my last recipe for two egg yolks, which would add some flavor and fat without the additional liquid of the whites. Armed with the modified pie crust recipe, I was ready to give meat pies another shot! I'm really happy with the results. 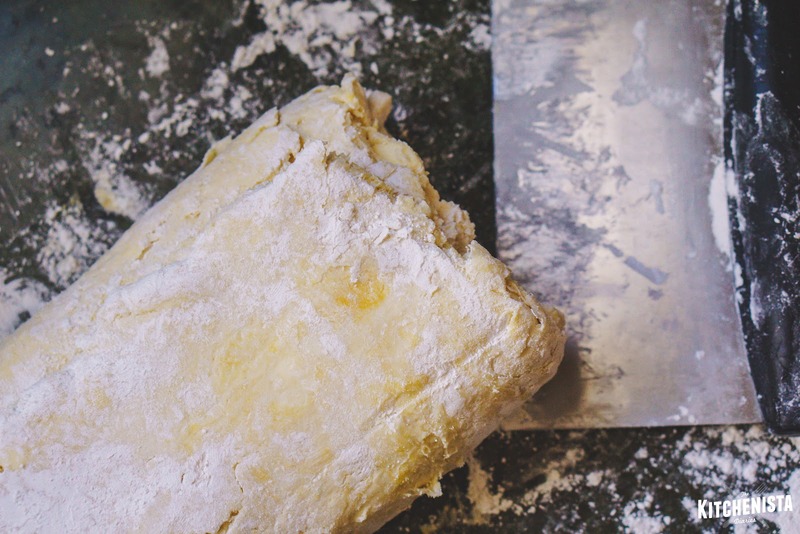 I've separated my recipe into two posts to cut down on the length, so this first part just focuses on making the shortcrust pastry which can be used for sweet or savory hand pies. The following post will cover the process of making the spiced lamb filling and assembly. If you've made my other crusts, this process will be familiar. The main thing to remember is that the butter needs to stay as cold as possible, so if at any time you feel it melting just stop where you are and transfer things to the fridge for a few minutes. For that reason, it's easier to make the pie crust in a very large bowl or sheet pan to contain the mess. Even though we've added bread flour for additional structure, you'll still want to avoid overworking the dough or your pastry could come out too tough. Mix both flours together with the salt. 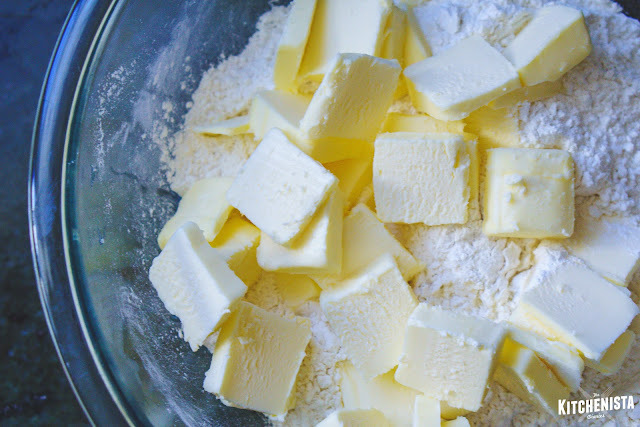 Add all of the butter, cut into pats. Toss the butter until it's all coated with flour, then use your hands or fingers to smash the butter pieces into the flour. I find it easiest to either smash it down with the heel of my hand, or squeeze it between my fingers into flattened pieces. Keep working the butter into the flour until you've got a mixture of pea-sized crumbles and flat discs. Work quickly so that you aren't warming things up too much. 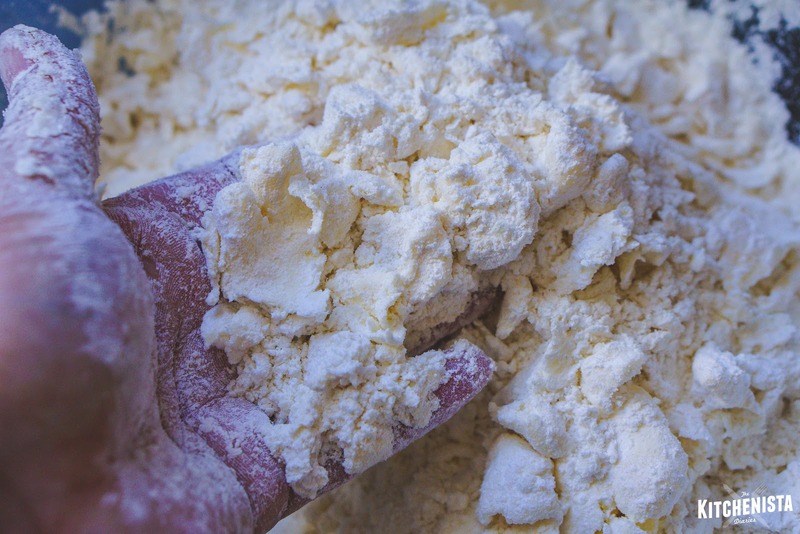 Make a well in the flour and pour in the two egg yolks and a few tablespoons of ice cold water. 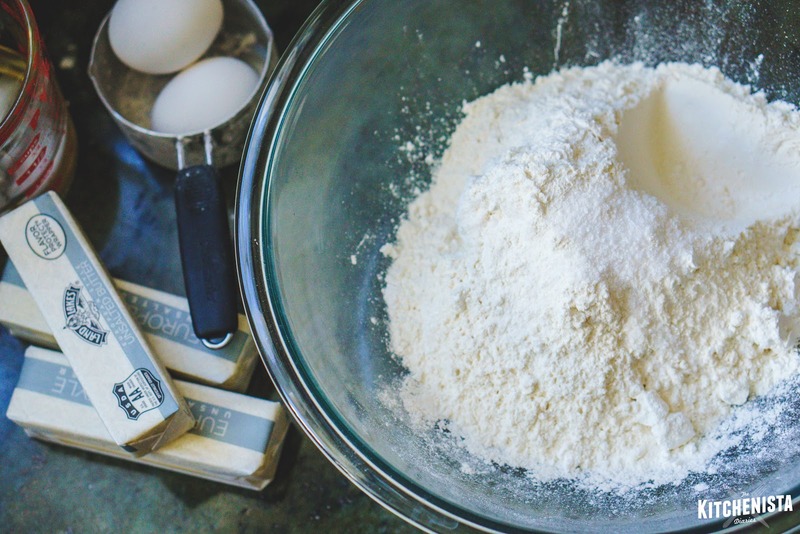 Use your hands, a fork, or a dough scraper to gently work the liquid into the flour. 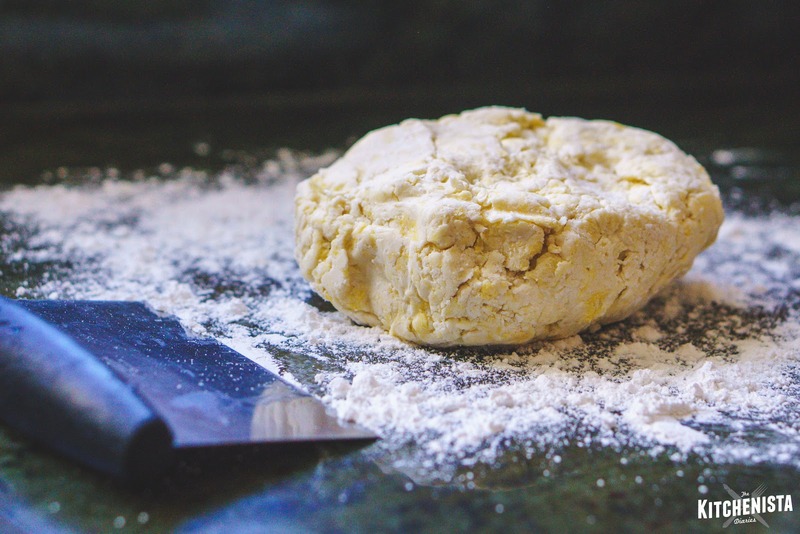 As areas of the dough start to form, move them out of the way and sprinkle additional water over dry pockets of flour. 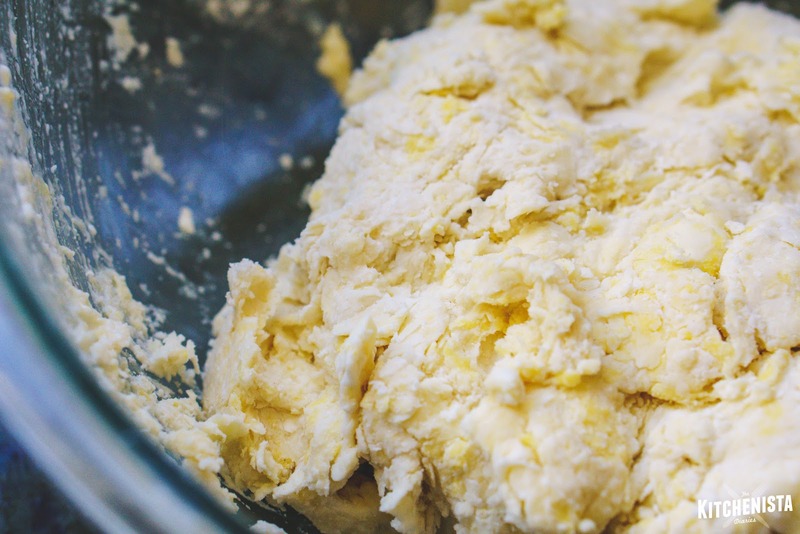 Stop when you can press the dough together into a shaggy mass. It shouldn't feel too sticky at this point, but it shouldn't be crumbly either. The goal is to use as little liquid as possible. That's a balance you'll get better at sensing by touch the more you continue to work with pie crust dough. 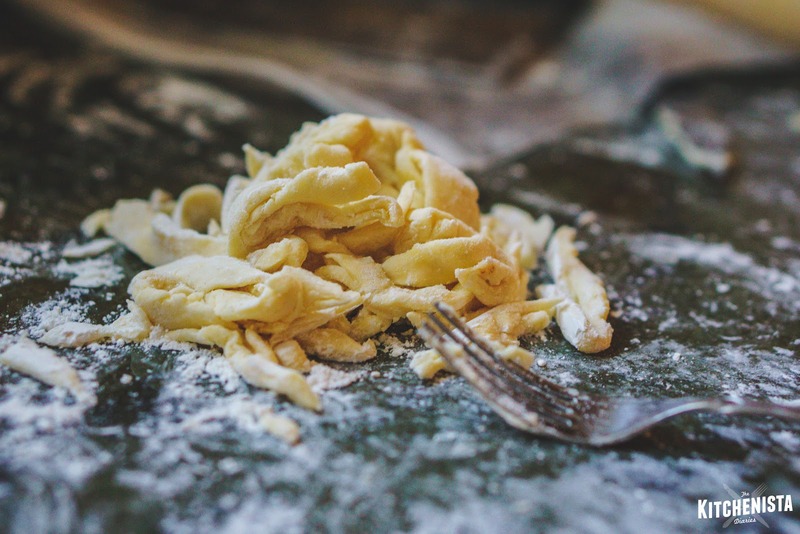 Wrap the dough tightly with plastic or transfer it to a freezer bag. Place in the freezer for thirty minutes to firm up the butter again. The time will also give all the flour a chance to hydrate. 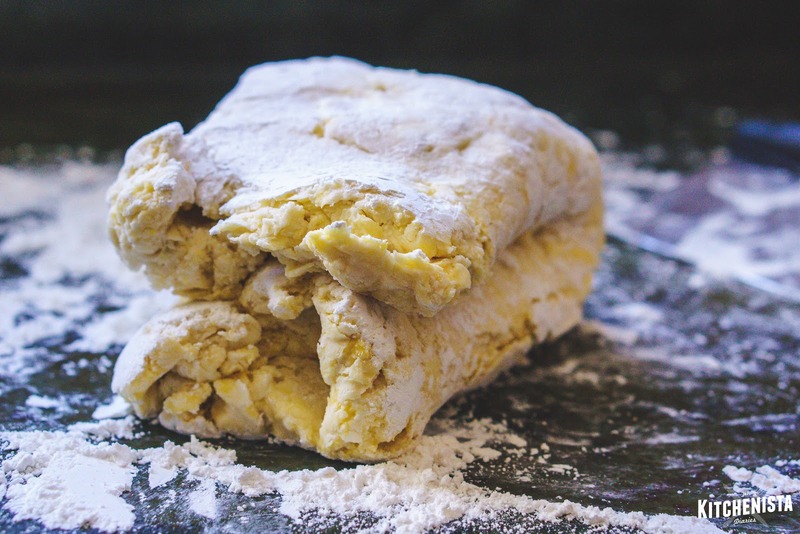 Dump the chilled dough out onto a floured surface. The next steps will strengthen the dough to make it easier to roll out later, and help create more flaky layers. It's kind of like what I'd do to biscuit dough. Using your hands or a rolling pin, flatten the dough into a large rectangle. Dust it lightly with flour. Fold it into thirds, then fold it onto itself again. Don't worry too much about how precisely it's folded or in what direction, this isn't puff pastry so you can relax a little bit. Now, flatten this stack of dough out again into a large rectangle. Dust it with flour, and repeat the folding process. Flatten it back out, and repeat the folding process again, for a total of three times. With each turn you should see and feel the dough become more pliable. When you're done, pat it into a large block that's about an inch and a half high. Wrap it in plastic again, or place inside a freezer bag. Refrigerate for at least an hour before attempting to roll out the dough. You can leave it in the fridge for a day or two, but I do recommend wrapping it tightly to avoid drying out. If you're prepping this further in advance, you can freeze the dough instead. Just transfer it to the fridge to thaw the day before you plan to use it. 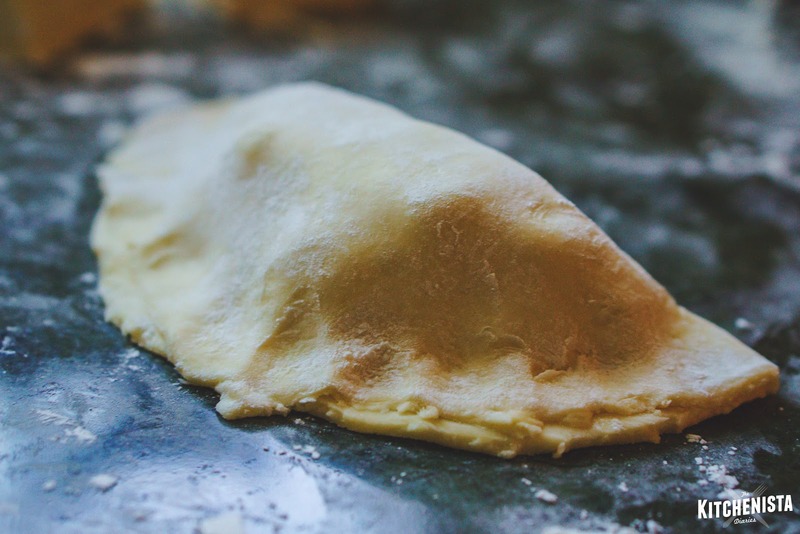 Once your filling for the hand pies is ready, cut the slab of dough into equal sections. I did twelve, which rolled out to about six inch circles for meat pies. 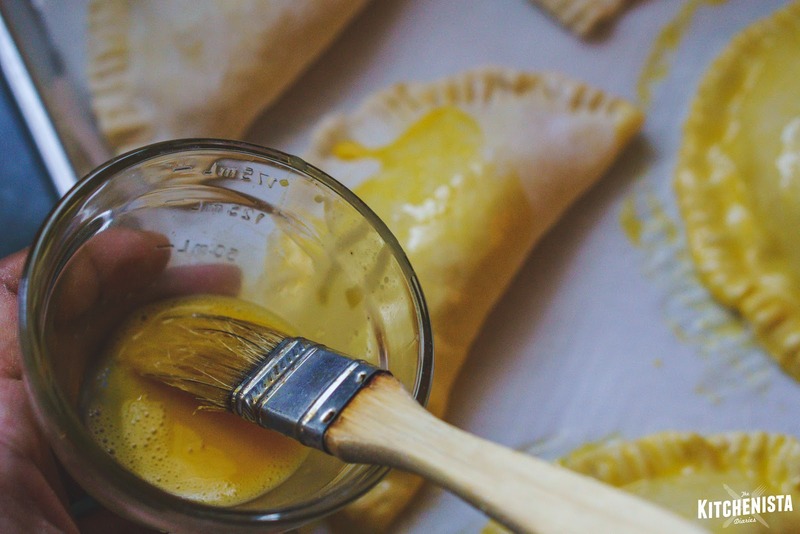 If you planned to do slightly smaller pastries, you can stretch that to sixteen portions. It's easiest to keep these on a sheet pan and move them back to the fridge so they stay cold. 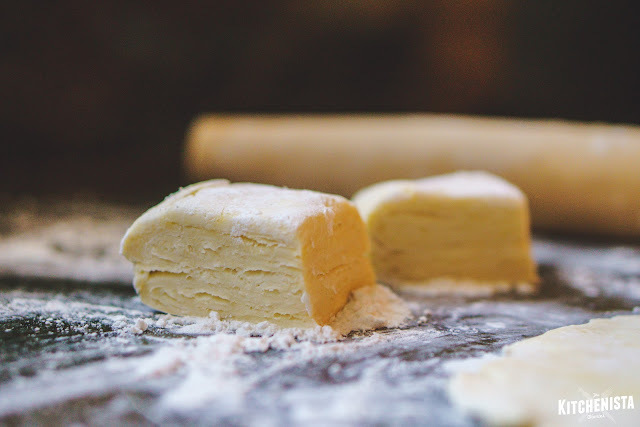 The streaks of butter throughout the dough are what will help puff up the pastry and create layers, so don't let it melt before it gets to the oven! Only keep on or two portions of dough out on the counter at a time as you roll and fill them. If you're ready to learn how I created these delicious meat pies, read on for the next post!